Earlier this year my friend Philip and I met up at Amicalola Falls State Park for a day hike to Springer Mountain, the southern terminus of the Appalachian Trail. Not being familiar with trail side parking I prefer finding a state park whose trails intersect with the AT. Vogel presented itself as the perfect option. 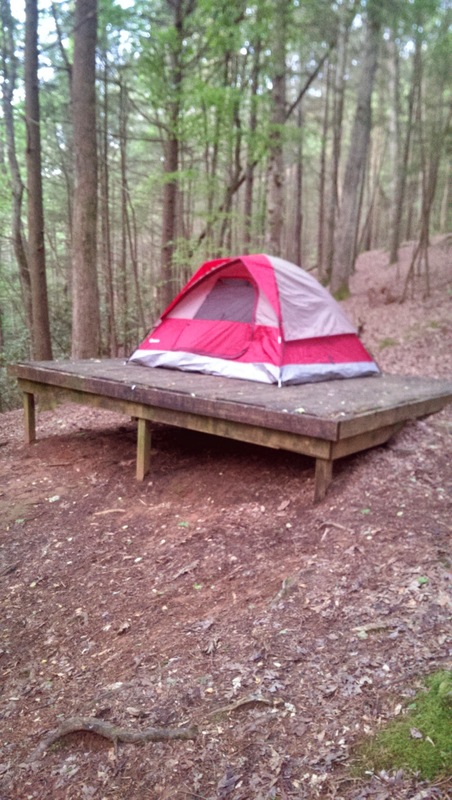 We would camp in the park, then spend the following two days on trail. After considerable internet research the final task was a visit to Black Creek Outfitters for a conversation with Jack Stucki. Jack is a veteran hiker, specifically as an accomplished AT through hiker. When planning to spend multiple days on trail my primary concern is always where to find water. Jack suggested David “Awol” Miller’s “The A.T. Guide 2014 Northbound Edition”. If you are looking for a resource to carry on trail this is a fantastic collection of information. Landmarks, elevation, mileage, shelters, privies and trail towns are but a few of the items found in the book. A bonus was picking up a pair of Salomon Pro 3D Ultra 2 Trail Running shoes at 50% off. We arrived at Vogel just before the Welcome Center closed. With proper registration in hand, and a stack of freshly cut fire wood, the tent was constructed. Opting for only trail snacks for the trip our next task was the 11.8 mile drive to Turners Corner Cafe. Sara went with the Turkey and Swiss Hoagie, while I opted for the Bacon Cheese Burger. Both excellent choices. Trust me when I tell you the burger was one of the best I’ve had. The following morning I woke up at 6:30 to walk with the do to the lake. 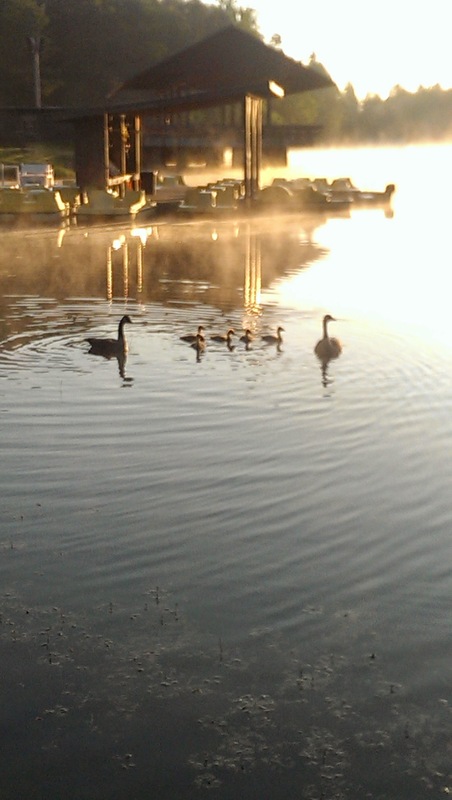 Runners were aplenty, though the lone family of geese announced their displeasure at Roxy racing along the shoreline, keeping them from making landfall. By 8:30 we were packed up and on trail. The Welcome Center will supply you with a free map, but I’d recommend reviewing it via the park’s site. 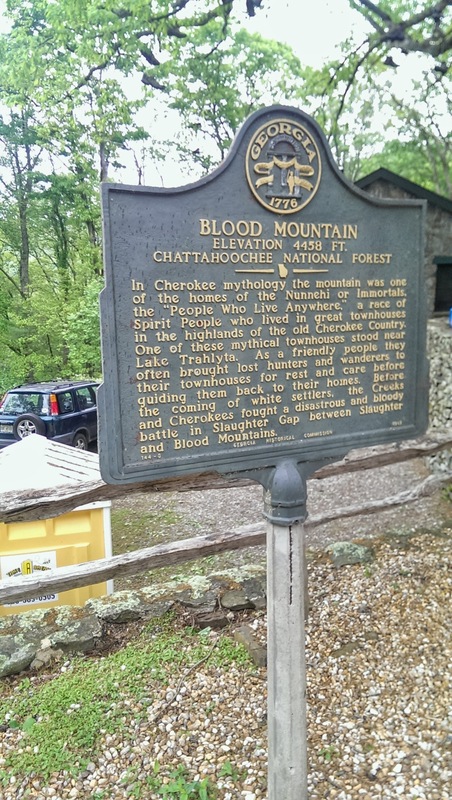 Required destinations were Blood Mountain and Mountain Crossings at Neels Gap. The former is the highest elevation of the Georgia section of the AT at 4458 ft/1359 m. The latter is the famous on-trail outfitters at Walasi-Yi. Jack informed me that after a change in ownership Mountain Crossings received a much needed facelift. 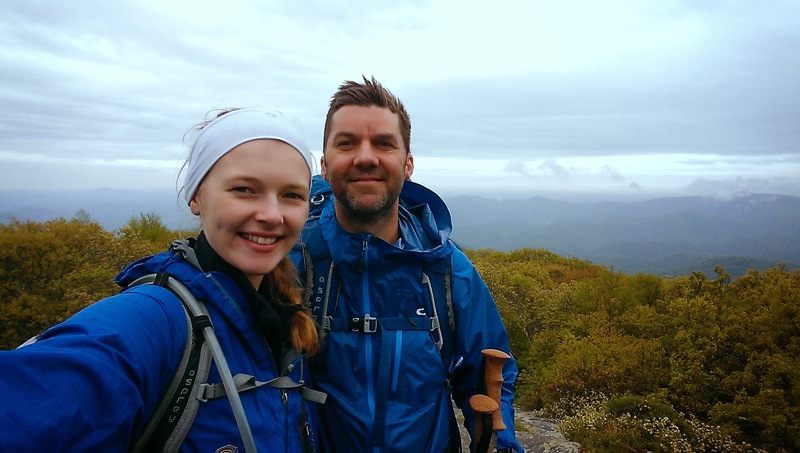 As to any negative reviews (and I did find one roughly three years old which was scathing), our experience was top shelf, though it should be noted a through hiker in need is a completely different experience. 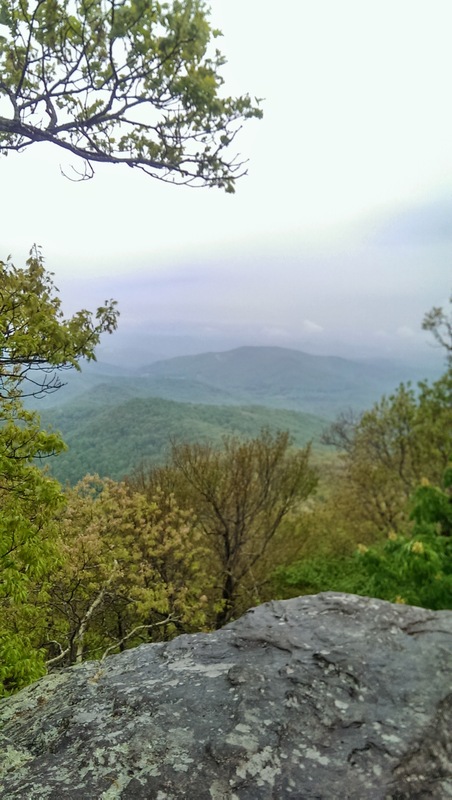 The planned hike would be the Bear Hair Gap Trail to Coosa Backcountry Trail to Duncan Ridge Trail to the AT. A clear morning, blanketed in 50 degree weather, made for perfect conditions. We entered at the Coosa trail which feeds into Bear Hair. Be aware that they share the same green blaze. Bear Hair Gap has noticeable elevation with a thick green canopy. The terrain is rocky, though not excessively, but the ascent does require some effort. When Bear Hair eventually meets up with Coosa pay careful attention to your map and compass. We managed to make wrong turn on Coosa which meant re-ascending. During this section the rain came, lightly, and with that a drop in temperature of roughly 10 degrees. 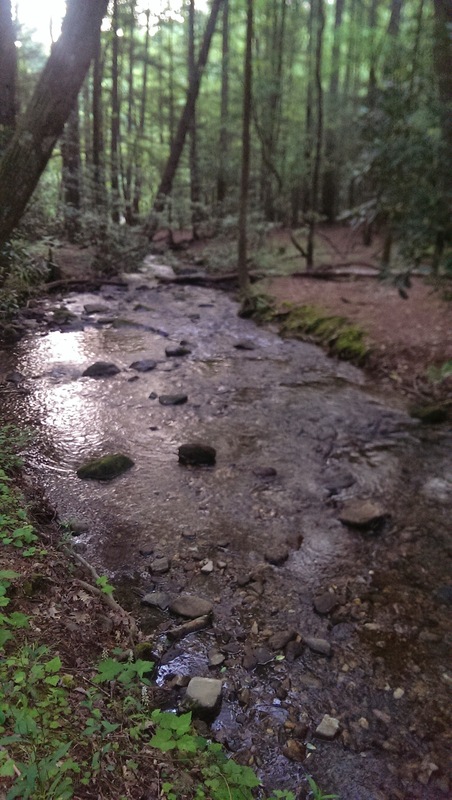 Coosa feeds into the Duncan Ridge Trail, which is a blue blaze trail noted as “Other USFA Trails” on the map. Here you will go left, a choice confirmed per a kind past hiker who carved the direction into the back of the trail sign. Duncan Ridge is true to its name which means you’ll stay along the ridge line for a less demanding hike. Based on conditions, and today was one of those days, you will get a good feel for the change in temperature moving from canopy, to ridge and then into open space. 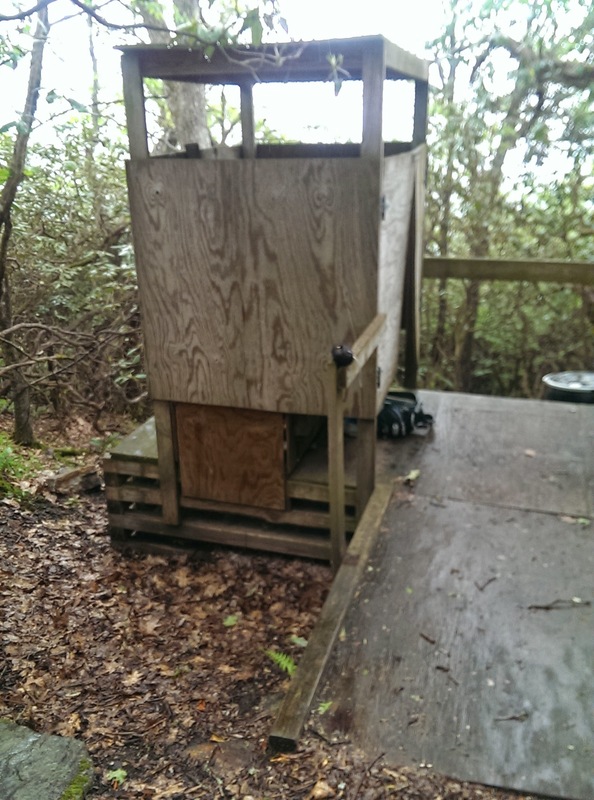 Reaching the summit of Blood Mountain was made more special by three specific elements: first, my daughter had the opportunity to use the privy, second were the through hikers we spoke with inside the shelter and third watching the joy my daughter experienced through being in the moment. The shelter had a unique smell which I can only assume is a mixture of past and present residents. What was most interesting to observe were the variances in gear. Some came to the summit looking like a mannequin from an outfitter. Others sported gear that’s surely seen hundreds of miles. Boots versus shoes. Shorts versus convertible hiking pants. Walking sticks versus hiking poles. But we all wore rain jackets. Coming down the mountain nature gifted us clarity, and the views did not disappoint. Roxy met other dogs, and assumed her less than social disposition. Thanks to cleverly place blazes it is hard to miss where to go. But be sure you look down as the markings are displayed on the rock under foot. Terrain and weather were less forgiving as we descended. Unlike the ascent, coming down was a condition of narrow passes over wet jagged rocks. Sara rolled her ankle for a second time which meant our loop would be cut short. What this also meant was that Mountain Crossings would not only be our stopping point, but also my starting line. Of the roughly three miles from Blood Mountain to Mountain Crossings I would say less than one mile is actually challenging. The other two are primarily a serene canopy, much like the hike up. You will hear the cars before you see the street. 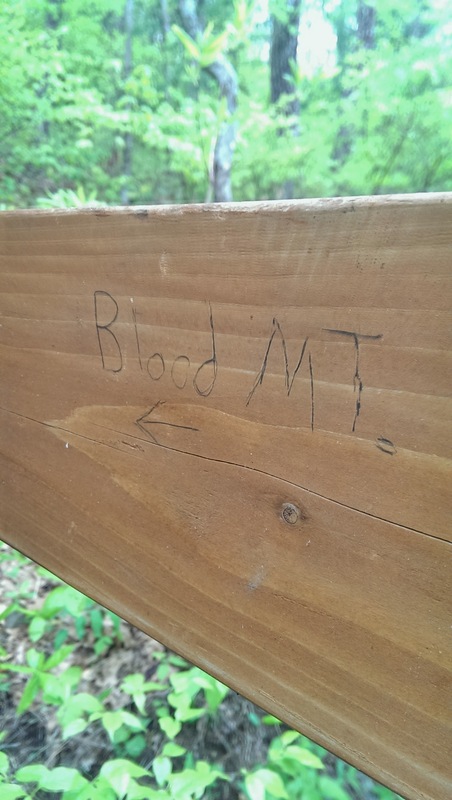 The hiking community, in my experience, stands above all others. 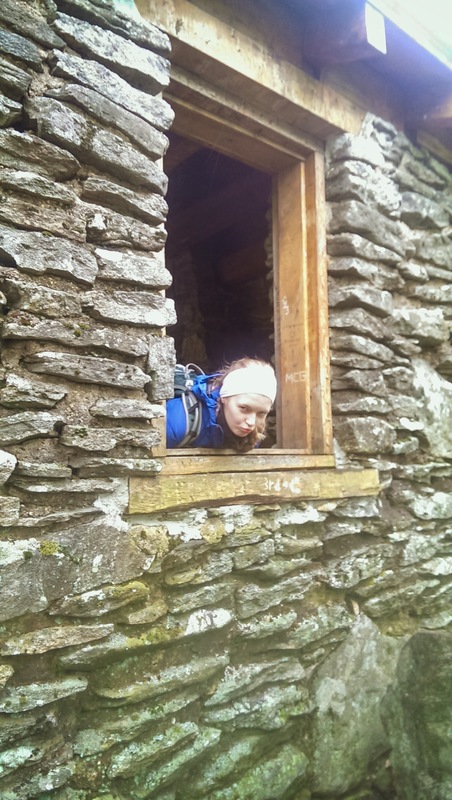 Mountain Crossings, in truth, is nothing more than an outfitter and a gift shop. Well stocked. 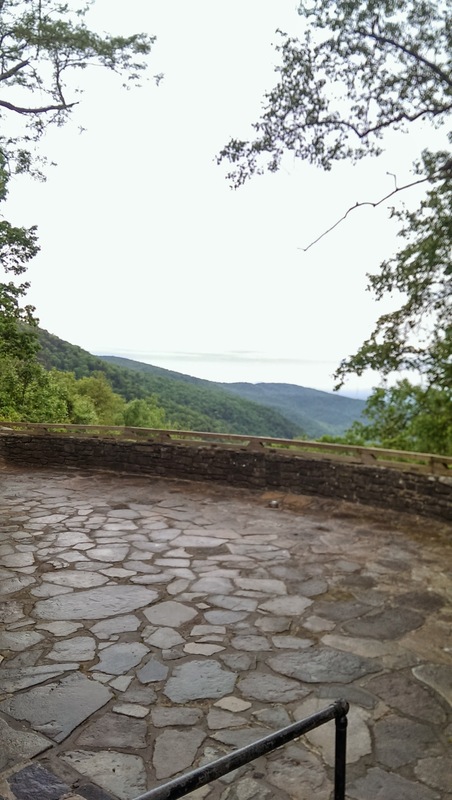 But the novelty of being on the Appalachian Trail, literally, along with the history not only of the building but the area makes it something more. They welcome your dog, all wet and dirty, which may be equally out of cordiality and necessity. Wanting to confirm the distance to Vogel State Park, which by my estimation was around 2.5 miles, I shared with one of the employees my situation. My daughter’s ankle was in a degree of distress and I need to run pack to the park. He thought it was three miles, though it was all down hill. Time to really break in those Salomon shoes. With sufficient shoulder room I began my sprint to the park. Back at Crossing they were tending to my daughter, and my dog, offering her a warm room with a television. They easily could have let her sit outside amidst the through and section hikers waiting out the weather and sharing their trail advice. For this level of humanity I will be forever grateful. Thankfully the distance was closer to my estimation and run/drive which could have taken around 45 minutes was closer to 30. 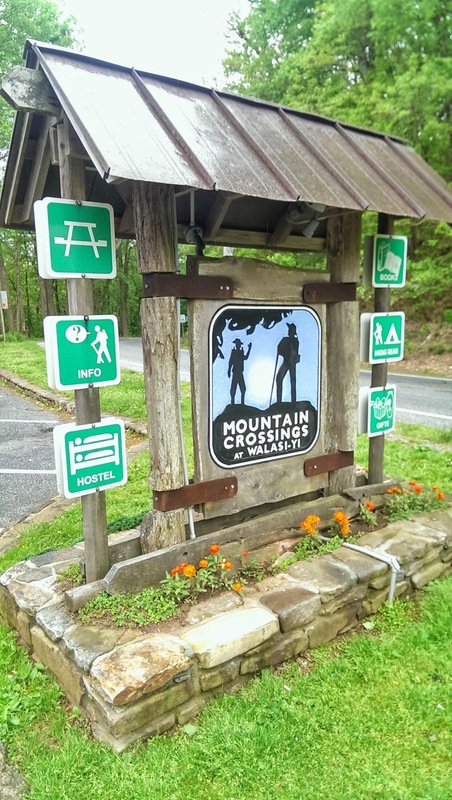 There are many sites which can help you plan a section hike on the AT, and these include transportation which is integral if you desire to not circle back, or if the trails do not afford a return loop. 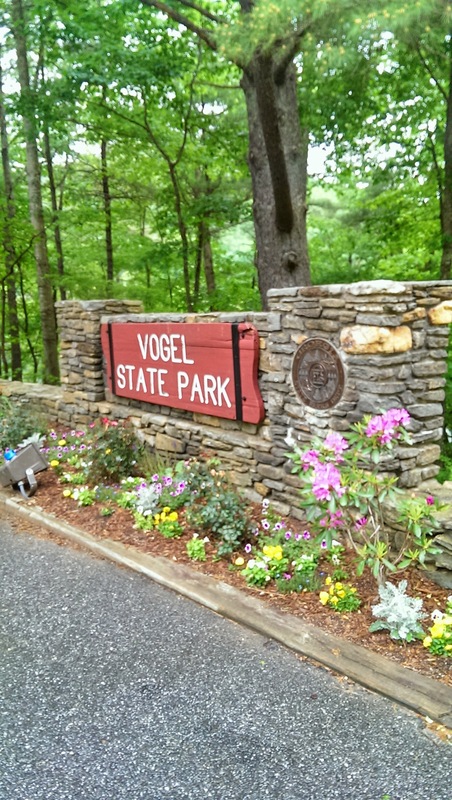 For someone who is new to hiking, or is seasoned, the Vogel State Park area is a perfect destination.